statements also produce integral values that are used for comparison. continue processing on the next case. of \u2018a\u2019. This means that \u2018a\u2019 is automatically converted to an int to perform the addition. then remove the breaks and see what happens. name of the class) the output will be: 1, 1, 2, 3, 5.
are taken from the original number in any order. Pairs of trailing zeroes are not allowed. become one of the major culprits that makes programming expensive. easily end up running out of resources (most notably, memory). 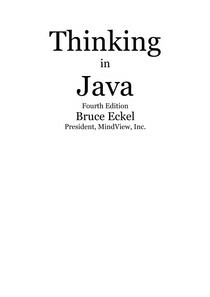 chapter examines the issues of initialization and cleanup, and their support in Java. sense that such a method will be called automatically during initialization. properly initialized before you can get your hands on it. constructors, since the name of the constructor must match the name of the class exactly.